Recipe makes enough for 4-6 servings. Heat peanut oil in a large deep pot to 350°F (do not fill more than one-quarter full). For sauce mixture: in a medium-sized bowl, beat the eggs with the water. Add hot sauce and whisk together well. Pour this mixture into a large plastic zip-top bag. For seasoning mixture: In a small bowl, combine 1 teaspoon salt, 1/4 teaspoon freshly ground black pepper and 1/4 teaspoon garlic powder. For dredging mixture: In a another bowl, mix flour, baking powder and 1/4 teaspoon salt. 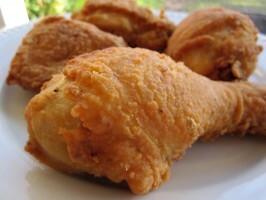 Rinse and pat dry chicken pieces with a paper towel. Cut breast pieces in half across ribs. Sprinkle chicken generously on both sides with seasoning blend. Drop a few chicken pieces of chicken into bag of sauce mixture and squish around to coat thoroughly. One piece at a time, roll chicken in flour mixture and drop into hot oil. Don’t crowd chicken pieces (it’s best cook no more than half the chicken at a time). Fry chicken until brown and crisp. Drain on paper toweling. Note: Dark meat will take about 14 minutes, white meat about 10 minutes. You can check for doneness by piercing to the bone in the thickest part with a fork. If the juices run clear, it is done. Adapted from a recipe by Paula Deen.